Meet Drag Princess Martha Kurt.He’s one of the greatest draq queens of popular Turkish night clubs. 30-years-old Martha started his career as an “intern drag queen” as she would like to recall himself referring to his days when he started working 4 years ago. Martha worked in the finest marginal night clubs in Turkey such as XLARGE CLUB, PENTHOUSE CLUB, MURPHY’S CLUB(BODRUM) and NEO ISTANBUL CLUB. His wild costumes are simply dazzling and his effort to create an original concept almost for every week has to be seen. -What does “draq queen” mean? Why did you choose this profession? Draq queens are –mostly gay- men dressed as a highly feminine and imposing woman. I chose this job to express myself better. I am not planning to be a transvestite and live like that. My mood is constantly changing so it’s better for me to show my soul as dressing like this. You have to be neither men or a woman to act like this and it’s not easy to be one of them. Every drag queen has an art form in his infrastructure. Either he is an actor or a singer or a dancer. He was born this way and best way to reflect this is to be a drag queen. 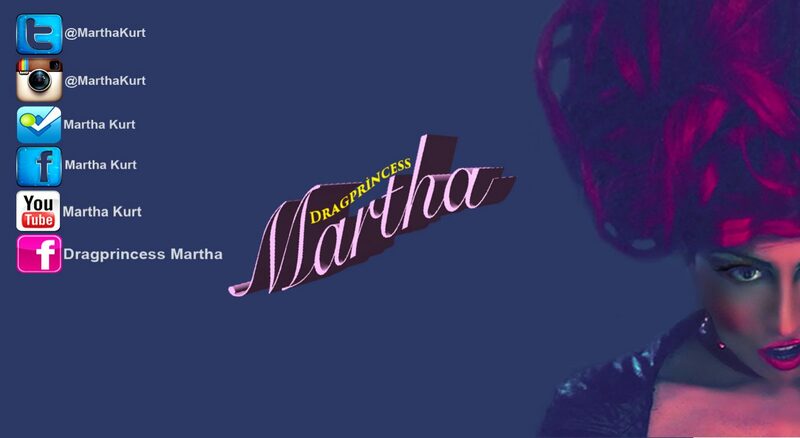 -How did u became the “Dragprincess Martha” as you are now? XLARGE CLUB has changed their show team and they were looking for new faces in their pages/website. I was going there when i go out. They hired me. But i was a rookie back then. The drag/show team were experienced and normally they didn’t want to show attention to me much. So i was an outcast. I have cried and felt really bad about it but i didn’t give up. I started to dance lessons. And after a 3 months of preparation i was ready to take part in the team again. But before i was in the backstage as an intern drag queen, learning how this profession to be done properly. I’ve started to take part in the shows later. But because of my financial problems i was also working as a waiter.I was cleaning up the backstage, then cleaning up the venue and serving drinks to customer when the night begins with high heels-on. It was really an exhausting job and in conclusion to this i was outcasted once again from the show team. -Did you ever think to give up? I didn’t give up yet, after XLARGE club i have started working in the Penthouse club with Draq queen Dora’s team. I don’t wanna be a waiter and feel bad, just wanna do the job i love. After that i’ve worked in Bodrum with choreographer Tuncer Merez in a club with Dancer Tarkan’s team. When the Bodrum season was over i’ve met with Ahsen Gönlüce who was the queen of CAHIDE (A famous show venue in İstanbul). She supports me with all her heart and recommended me to the place that i work now. I am working in NEO ISTANBUL now. My boss really appreciates my work and i feel that deeply. I try to be worthy of this appreciation every week. In conclusion, i’ve seen the greatest representatives of this profession. All of them are cranky but also the wisest individuals. They can be the best but also the worst characters. I’ve paid my dues to be successful in this career. The people who were calling me “peasant girl” once, now proud of with my determination. Thanks to Martha. You can reach him this social media accounts below and you can see him live at NEO ISTANBUL CLUB only! **All materials, content and forms contained on this website are the intellectual property of Gays of Turkey.com and Murat Renay and may not be copied, reproduced, distributed or displayed without backlinking to our website as the source.